Detailing the physical features, habits, territorial reach and other identifying qualities of the Yucca Moth. Stretching beyond the Southwest and Mexico, Yucca Moths are little angels to the plants they happen to feed on. Though yucca and agave plants are native to the arid and semi-arid regions of the continent, they have become popular as ornamental plants in areas they do not normally grow. Yucca Moths, like most living creatures, travel with their food, so the range of this moth covers a large part of the continent and they can be found wherever yucca and agave are growing. Yucca Moths are dependent on yucca plants for larval food. Yucca plants are dependent on Yucca Moths for pollination. The symbiotic relationship between the insect and the plant is remarkable because the moth does not take advantage of the plant in ways other insects might. Male and female adults emerge when the yucca plant begins to bloom. They spend their time and energy in reproducing, not eating. A female collects pollen from one flower and lays a few eggs in the ovary of one yucca plant if no other female has done so before her. She then leaves the plant and finds another yucca to lay more eggs in. After doing that, she delivers some pollen to the stigma in a flower to ensure that seeds will develop for her offspring after they hatch. She is conservative in how many eggs she lays, which allows the yucca plant to still have seeds leftover for its own reproduction once the larval moths are done feeding on them. This practice makes it possible for both species to have offspring the next year. Yucca Moths are generally white, though some have black speckles on them, or are completely grayish black. 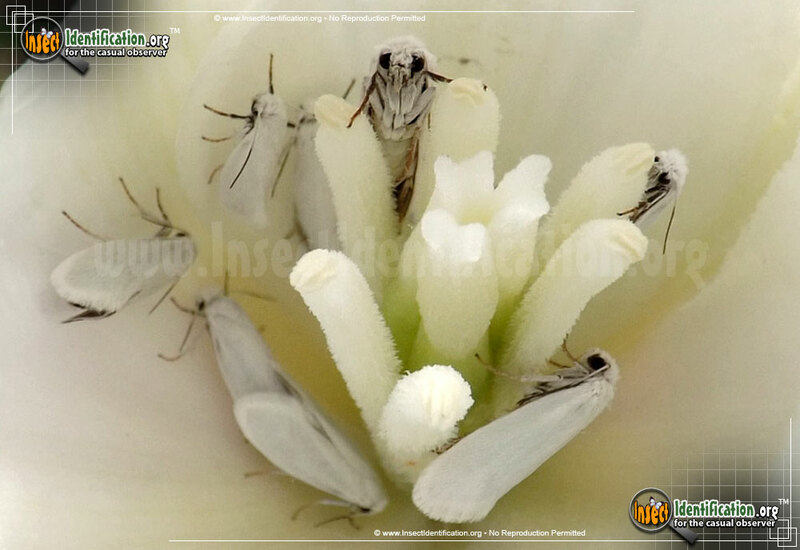 They congregate inside the flowers of the plant and are quick about their work. Some species have 'tentacles' instead of the thin tongue usually attributed to moths. Caterpillars are fleshy and plump with a rosy-orange color. When they are ready to pupate, they go underground for a year or two. Look for Yucca Moths inside their host plants when they are blooming. Scientific Name: Tegeticula, Greya, and Prodoxus spp.